Here are finished Elvis Quilts...didn't think that Mona measured up...I have such talented friends. Here are the eleven that took on the challenge and finished by the deadline! The top eight, as voted on by visitors to the Columbus Visitor Center, during pilgrimage http://www.columbus-ms.info/visitors/spring-pilgrimage/pilgrimage-2012.aspx, will be sent to the AQS quilt show. During pilgrimage towns people dress up in period costumes and show the antebellum homes. We have musicians playing and our group gets out and quilts in the homes, while wearing period dresses. Not me of course, I go to work...plus, I have never been much for dressing up or hand quilting (while beautiful not my cup of tea) ... give me my machine!! Judy Stokes - "In the Ghetto"
Lawana Schultz - song: "Take These Chains from My Heart"
Christine Anderson - song: "T'here Ain't Nothing Like a Hound Dog"
Brenda Crownover - song: "Moody Blues"
Bobbi Hommel - song: "Good Luck Charm"
Carol James - song: "Let Me Be Your Teddy Bear"
Linda Baines - song: "Hawaiian Sunset"
Watana Cantrell - "Swing Down Sweet Chariot"
CC Coggins - songs: "Blue Sued Shoes" and "Hound Dog"
Julia Graber - song: "In My Father's House"
Terry Turnage - song: "Mona Lisa"
So come to Columbus, visit some cool old houses and vote on our quilts. Tickets are available at the visitors center...pick your favorite eight...it will be a tough decision. Working on Mona tonight....not real happy about some aspects, but others I love. I suppose it is that way about most creations. Here are some photos as I am sandwiching the quilt together tonight. Side note: I edit and save the photos right side up, so why are the switching back to being sideways...they are staying cropped so I don't get it....ugh. Sue is doing great, and is staying really positive. After I left Sue and Bill's home, I stopped in Tryon, NC to see my brother Edwin and his wife Katrina. They just bought a farm there. Ed was carving their initials on one of the tree there...such a romantic! I was treated to seeing their horse's, 4 day old baby. She was certainly pretty. Belle and her 4 day old baby. After I left Ed and Kat's I headed to home, but decided to stop by the Mountain fest quilt festival. I number of my quilty friend were there and some had won awards. This years theme was "What tickles my fancy"
This was made by Judy Stokes. Next year's challenge fabrics...and the theme is The Blue and the Grey: Quilting America's Great Divide. 30% of the quilt must be made from at least 3 of the 4 fabrics. So I need to get my lesson plans and grades in so I am going to end with some eye candy from the show. Free book on Kindle ... Pray What God Says here is the link. These change back to paid titles without warning, so be sure to double check that it is free!! I still have to put the hands on and the eyes, nose and mouth are not sewn down...but all the blocks are sewn together. Should the eyes be bigger? Hmmm....here is a close up. Sill need to do the hands and figure out how all of this will go together. started sewing the 540 blocks together to make mona and she is getting a little wonky...any suggestions quilty friends? I also nailed the foam core boards I had used to lay it out on the back of the closet across from my sewing table....loving it already! 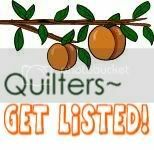 This year I am vise president of our local guild, Possum Town Quilters. So I came up with the idea of following along with the craftsy block of the month challenge. It is free...click here to enroll and join in the fun. In general, I am not a big fan of the sampler quilt...I like pattern and repetition, and seeing how changes in color and value effect that pattern...but thought that a sampler quilt would be a great idea for the guild as you would cover a multitude of skills and techniques to stretch our quilting skills. My inspiration for the colors in my quilt will be one of my mother's paintings. About a month ago, I decided my bedroom was too bland, so I took one of the small paintings with me and found some fabric to make drapes out of. That helped, but still, it was lacking. I moved a number of paintings around in my house...I had 7 of these hung, but they were scattered about the house. I gathered them up and now all are hanging in my bedroom, except the one pictured, which is in the hall on the way to the bedroom. So I have pulled these fabrics to start with. For January the lesson had you make two slash blocks. A wonky pound sign and an astericks...neither were my favorite, but I made two of each as samples. March is here and I have done one of the blocks...I am pretty happy with this, but it may be a little too red, so I may redo it too.. So go to the link and join in...it is not too late. You only have to have 6 blocks made by the end of March to be caught up.